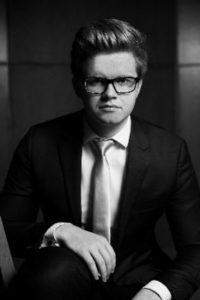 Praised for his sensitivity and artistic integrity, twenty-two-year-old Carter Johnson has established a reputation as one of Canada’s most promising young pianists. In 2018, Johnson won the top prize in two of Canada’s most important competitions, winning both Grand Prize in the Concours OSM Manuvie as well as First Prize (along with the prize for the best performance of the test piece) in the CMC Stepping Stone competition. He has performed with orchestras including l’Orchestre Symphonique de Montréal, the Victoria Symphony Orchestra, l’Orchestre Métropolitain, and the Orchestra of Northern New York, and his playing has been broadcasted by Medici TV and Radio-Canada. Johnson’s extensive experience both in concert and in competition has taken him across three (soon to be four) continents. In addition to an ARCT in Piano Performance with Distinction, Johnson also holds an ARCT in Piano Pedagogy, for which he won the national gold medal for the highest mark in Canada at the age of 18. He began piano at age five with Shelley Roberts, with whom he studied for twelve years, and he now studies with Mark Anderson in Vancouver. Johnson holds a Bachelor of Music in piano performance from the University of British Columbia, also studying with Mark Anderson. Johnson’s love of singing began at age 13 when he began work as a collaborative pianist at a local voice studio. A few years later, he began studying voice privately, and he eventually entered UBC as a double major in voice and piano, studying voice with Patrick Raftery. Since that time, he has continued to work extensively with singers in the fields of both opera and art song, and he works as a vocal coach both with UBC Opera as well as independently. In addition to his musical career, Johnson is an accomplished actor and speaker: he holds his ATCL with Distinction in Speech and Drama from Trinity College London and has won many awards for his performances of Shakespeare. He currently lives with his wife Hannah and their son Preston in Vancouver where he is active as a soloist, teacher, vocal coach, and collaborator.